So true... As a Spanish, I still remember the fist Argentinian movies that I saw, I always needed around 15 minutes into the movie to fully get used to their accent. The fact that Andalucians drop their "s" at the end of words makes it really hard for me to understand what they're saying. And then you have my brother who learned Spanish in Andalucia and Chile (on top of his native French accent!). He's been asked often where he learned it. 100% how I feel! Having learnt Spanish in Madrid I felt fairly confident in communicating in Argentina. My first experience there was stopping at a bus station that was experiencing a black out, and a guy asked for my orange peel for his mate. The combination of his bizarre accent and request (at least to me) totally threw me off for a good while. I'm just curious... why on earth did he ask for an orange peel? On the opposite side, I (spaniard) still have trouble understanding Australians and New Zealanders. I'm a native English speaker and I sometimes have trouble with really pronounced accents. Add regional slang and sometimes it's like "I'm pretty sure that was supposed to be English, but I have no idea what you just said." There is a "saying" in Germany - ein sächselnder Schwabe in Bayern - putting together the 3 most ununderstandable dialects to mean something like "he just does not get understood". When I was in Japanese class (near saxony) there was a Schwabe. When he first said something you could hear the gears in all people's heads coming to a stop. The Japanese teacher needed 2 seconds, then she got what he said. She was probably the only one in the room. We got used to him but the first week was strange. I'm argentinian and I'd know lmao. Too many local words, and all of them too fast. (Chilean here). 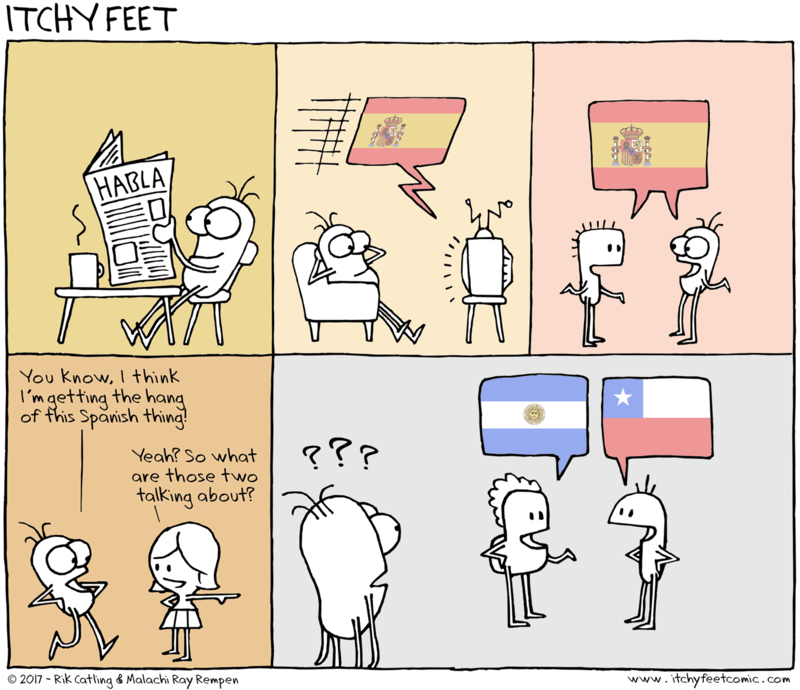 When speaking with people from other countries, we slow down and stop using the local slang. I understand how that seems like a different language. I remember when I was working on my Spanish listening comprehension, I watched this Chilean movie called El Club, and aside from being a terrible movie, I only understand about 10% of what was being said. My wife and I watched a Scottish film recently and I had to assure her that yes, her English is excellent, and no, I didn't understand anything they were saying either.